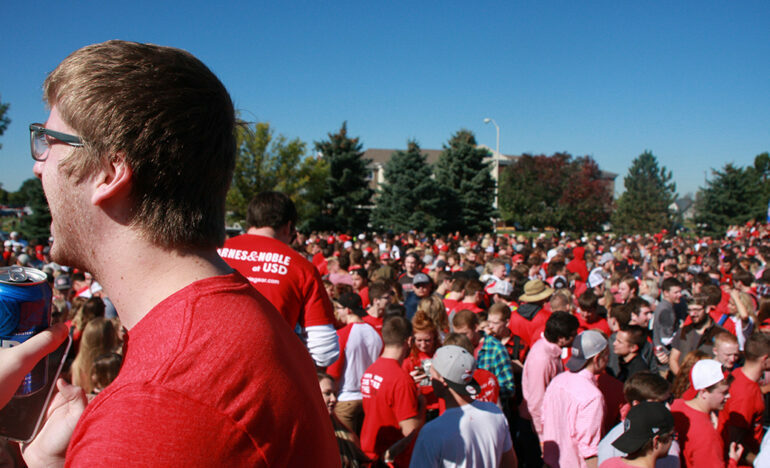 In the days following the Dakota Days football game, USD students faced rule changes to the pregame tailgates as a result of several injuries and damaged vehicles. In an email from the USD Involved on Oct. 12, the updated rules for the Oct. 17 home game were listed. They included: vehicles and glass are no longer allowed, all bags and coolers subject to search and anyone throwing beer in the tailgate will be arrested. Doug Wagner, director of programming and activities, said in an email the changes were made because of safety concerns. Wagner said the changes were decided by himself; Kim Grieve, vice president of student services and dean of students; Pete Jensen, director of the University Police Department; Dan Gaston, senior associate athletic director and David Herbster, athletic director. The rules aren’t permanent, Wagner said. The student tailgate section was largely empty before the Oct. 17 football game. Sophomore Ryan Mohr said he thinks the prohibition of vehicles was a big reason behind the low attendance. “Once they got rid of the vehicles, no one came to tailgate,” he said. SGA held an open forum for students about the tailgate changes Tuesday night. Wagner discussed possible options going forward and incidents that have occurred in previous tailgates. “It has gotten to a point where the law will find a way to resolve this one way or another,” he said during the forum. SGA senators discussed how tailgate could be shaped in the future. Suggestions included searching vehicles, only opening tailgate to USD students and copying the more open setup of the alumni tailgate section. Few students in the audience provided any feedback or input, despite the higher than usual attendance at SGA meetings. SGA senator Kelsey Berger said she thinks the main point of the student reactions was about the trucks being forbidden. President James Abbott said the primary objective of the changes is to keep students safe.